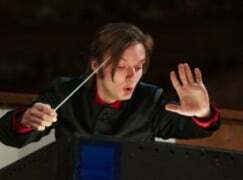 In an act reminiscent of Stalinism, staff members of the Novosibirsk Opera have removed the principal conductor’s name from its website. There is still a sign on his door today (we are told) but it appears that Ainars Rubikis is no longer in control of artistic affairs of the opera house where a production of Wagner’s Tannhäuser caused the Kremlin to fire the general manager. Ainars, a young Latvian who won the 2010 Gustav Mahler conducting competition, stands behind the Tannhäuser production. In a letter today to colleagues and friends, published exclusively in Slipped Disc, he seeks to put the record straight on what really happened in Siberia and to dismiss false rumours that he has supposedly abandoned the opera company. Many colleagues and friends have asked me why I have not participated in the debate surrounding the Tannhauser situation at Novosibirsk State Opera House…. I am grateful to all those who have written letters and petitions in support of Tannhauser. A press article I came across some time ago prompted me to address the members of audience, colleagues and friends in the music world. In particular one of the reasons given for the removal of Tannhauser from the Novosibirsk Opera House repertoire is that the new head of the Opera House [Vladimir Kekhman] was unable to get in touch with the play’s director Timofey Kulyabin. This claim comes as something of a surprise in the modern age of mobile phones. However, no one can be available for conversation every minute of the day. Each has their own obligations to themselves, to their work, to the people with whom they work and we bear collective responsibility for the results of our work. I know Timofey Kulyabin well: he is a responsible person; I know his attitude towards his work and his very intense rehearsal schedule. And from my own experience I can say that any outside interference with the creative process can lead to negative results. It was I who invited Timofey Kulyabin to direct Tannhauser. I saw the play ‘Onegin’ directed by him and realised that he is a great and sensitive artist. As Musical Director and Conductor I take full responsibility for the Tannhauser performance and for the team that staged it. And for that reason I would like to repeat what I said at the press-conference before the opening night: I am grateful to every person in this theatre – from the cloak-room attendants to the General Manager who all helped me to create and to produce this performance. The second reason mentioned in the press concerns me personally – the apparent financial difficulties between the theatre and myself. I categorically deny these rumours. My financial relations with the theatre have nothing to do with its removal from the repertoire, nor with the creative process in the theatre. The theatre’s financial obligations towards myself have always been resolved. So talk of my “deserting” Novosibirsk at the end of my three-year contract are unfounded. In a situation of global economic crisis at the start of this year Novosibirsk Opera House and the agent representing me, Askonas Holt, worked out a new plan for our collaboration with the theatre, which we started implementing with the theatre’s then General Manager Boris Mezdrich. According to this plan we were looking for a mutually acceptable and most effective solution given the circumstances, and to do everything possible for the theatre’s professional development and forward progress. How else could you explain my presence at the theatre from 10 to 16 March 1015, including two performances of Tannhauser, conducted by myself? Over the three years I spent in the position of chief conductor and musical director, the artistic team at Novosibirsk Theatre has shown an unbelievably high rate of professional growth. Of course it is difficult for me to judge, because all the performances were like children to me and parents often don’t notice the development of their children. In the same way it is difficult for me, working with these people every day, to assess their professional growth. But I know that this growth has been assessed by professional experts both in Russia and abroad. I cannot not take their word for it. Each opera and ballet artist, orchestra musician, member of the choir or of the ballet corps is aware of their own responsibility, as they work towards a single goal: to build a professional theatre, whilst continuing to develop themselves and take part of the overall process of development, not resting on the laurels of individual achievements. It was this which was our aim and the basis for our work together: not to look to the past, but forward to the future. To undertake new creative challenges and to reach new heights. Such as Bernstein’s Mass, Stravinsky’s Holy Spring, Honegger’s Joan of Arc and Tannhauser. And many other challenges, when – in difficult circumstances – each of us worked selflessly with the aim of attaining the highest possible level of artistic achievement. For this I am, unreservedly, grateful to my colleagues – musicians and conductors. I am proud of them. Today I am not ashamed to showcase to the whole world the level of quality at our theatre and the fruits of our labours, because each of the musicians bears not only personal, but also collective responsibility and is aware that they can never rest on what has been achieved in the past. It is essential to constantly uphold the level of quality of each performance, each project and concert, analysing both achievements and failures. Ainars Rubikis is a wonderful conductor and a truly wonderful human being. Bravo. Norman, Stalinism murdered the person before removing the name from the website; the practice of removing the name from a roster is standard practice.